This report is also available in printer-friendly, easier-to-read Adobe Acrobat (.pdf) format. Niger and the Intelligence Fabrication. The allegation that Iraq was trying to purchase nuclear materials from Niger was the key to the administration’s case for war. The CIA always had doubts about the authenticity of the Niger reporting but, when the item appeared in a DIA intelligence highlight on February 13, 2002, Vice President Cheney began to hammer the CIA about its views on Iraq’s search for enriched uranium to assist in its nuclear weapons program. In response to constant importuning from Cheney and Lewis Libby, the CIA asked Ambassador Joe Wilson to visit Niger. During the same period that Wilson traveled to Niger and reported back to the CIA, Marine Corps General Carleton Fulford and Ambassador Barbro Owens-Kirkpatrick conducted their own investigations and reported back to the Joint Chiefs of Staff and the State Department, respectively. All three reported emphatically that there was no substance to the intelligence reporting that Iraq was trying to buy uranium yellowcake from Niger. In December 2002, the NSC and the CIA negotiated language on the Niger uranium deal for the president’s State of the Union address. A senior CIA official, Alan Foley, convinced the NSC’s Robert Joseph that the Niger story could not be linked to CIA intelligence. But Foley agreed to the infamous sixteen words in the State of the Union address: “The British government has learned that Saddam Hussein recently sought significant quantities of uranium from Africa,” a claim that was also false. Fifty days after the fall of Baghdad, on May 29, 2003, President Bush emphatically proclaimed that the United States “has found the weapons of mass destruction,” which turned out to be the mobile biological labs.5 This purported justification for the invasion of Iraq was repeated by every prominent member of the Bush administration over the next nine months. The CIA and the DIA went so far as to jointly sponsor and publish a White Paper in May 2003 that described the labs as the “strongest evidence to date that Iraq was hiding a biological warfare program.” It emphatically refuted an explanation by Iraqi officials that appeared in the New York Times that referred to the trailers as mobile units for producing hydrogen.6 Two days before the president’s remarks, however, the Pentagon received a three-page field report from a team of U.S. and British experts in Iraq who examined the trailers, one of whom referred to them as “the biggest sand toilets in the world.”7 Thus at the highest levels of the Pentagon, the CIA, and the DIA, it was authoritatively known that there were no mobile biological labs before the president, the vice president, the secretary of state, and the secretary of defense heralded the so-called find as justification for the invasion. No Links between Iraq and al Qaeda. The intelligence community initially tried to convince policymakers that there were no significant ties between Iraq and al Qaeda, but some senior members of the Bush administration, particularly the president and the vice president, argued that Iraq was behind the terrorism of al Qaeda in an effort to manipulate congressional and public opinion. President Bush said on September 25, 2002 that “You can’t distinguish between al Qaeda and Saddam when you talk about the war on terror” and, at a press conference in December 2005, he repeated this observation.8 Secretary of Defense Rumsfeld claimed on September 27, 2002 that he had “bulletproof” evidence of ties between Saddam and al Qaeda, and Secretary of State Powell described a “potentially…sinister nexus between Iraq and al Qaeda, a nexus that combines classic terrorist organizations and modern methods of murder.”9 The most explicit statement of contacts between Iraq and al Qaeda came from Vice President Cheney, who argued that one of the hijackers, Mohammed Atta, met with a senior official of the Iraqi intelligence service in Czechoslovakia in April, several months before the 9/11 attack.10 The Czech intelligence service denied such a meeting ever took place and the intelligence community had authoritative information based on telephone intercepts that Atta was actually in the United States during the month of April. In actual fact, the information that Iraqis had trained al Qaeda members to make bombs with deadly gases came from a top al Qaeda operative, al-Shaykh al-Libi, who was tortured in Pakistan and recanted his claims in 2004. 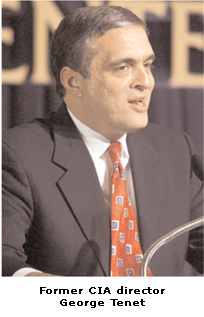 As a result, the CIA recalled all intelligence reports based on his statements, nearly two years after the Defense Intelligence Agency informed policymakers that al-Libi had lied.11 But when the White House wanted more support for the argument regarding Iraqi-al Qaeda links, CIA director Tenet obliged with a letter to the Senate and House intelligence committees falsely asserting evidence of such links, and CIA analysts wrote the section in Secretary of State Powell’s speech to the United Nations Security Council (UNSC) describing the links. Prior to the State of the Union message, CIA Director George Tenet and Deputy Director John McLaughlin briefed the president on “the case” for war based on the CIA’s intelligence on WMD. President Bush found the presentation inadequate, particularly because he found that it wasn’t “something that Joe Public would understand or gain a lot of confidence from.”12 Bush turned to Tenet and remarked “I’ve been told all this intelligence about having WMD and this is the best we’ve got?” The CIA director jumped up from his wing-backed chair in the Oval Office and gave the president the answer the administration desperately wanted, “Don’t worry, it’s a slam dunk!” In fact, there turned out to be enough misinformation for two slam dunks: the president’s State of the Union in January and the secretary of state’s address to the United Nations in February 2003. Although the intelligence community played only a minor role in the planning for war, the failures of intelligence were stunning and comprehensive and point to major problems within the community, particularly within the CIA. There was no understanding of the intentions and motivations of Saddam Hussein; of the decrepit state of Iraq’s political, economic, and military situation; and the fact that there were no weapons of mass destruction and no programs for reconstituting the capabilities that existed before Desert Storm in 1991. And it can now be stated definitively that the CIA was egregiously wrong on every aspect of Iraqi weapons of mass destruction—nuclear, biological, and chemical. Every aspect of the CIA’s findings on the so-called huge stocks of biological and chemical weapons was incorrect, and their conclusions about the so-called nuclear program were created for the most part out of whole cloth and, in some prominent cases, fabricated. Nevertheless, the CIA continues to display no interest in understanding the analytical failures that took place. Neither a post-mortem nor an accounting of lessons learned has been produced to suggest that the CIA has refined its processes for the collection and analysis of intelligence. The Phony National Intelligence Estimate and the Phony White Paper. It is instructive to examine the NIE titled “Iraq’s Continuing Programs for Weapons of Mass Destruction” (October 2002) and the unclassified “White Paper” because of the specious nature of their assumptions and conclusions. Every one of these assessments’ claims was false, including charges on stockpiles of chemical and biological weapons; reconstitution of nuclear weapons; and the capabilities of unmanned aerial vehicles. The estimate was the most egregious example of intelligence politicization in the history of the CIA. The fact is that Iraq did not have any of the weapons that the CIA claimed it had and had no production programs for making such weapons. The declassified estimate, moreover, the so-called White Paper, was even more egregious, serving as an example of policy advocacy to support a decision to go to war. This violates the CIA’s charter that prohibits propagandizing political matters for the American public. As former director of IAEA, Hans Blix, concluded, "Never before has a nation had 100 percent confidence about its intelligence with 0 percent information." The unclassified White Paper omitted much of the more balanced language in the classified version. The classified version estimated that Iraq would not obtain nuclear weapons until 2009, but the White Paper drops the dates and suggests the imminent possibility of Iraq going nuclear. The estimate and the White Paper linked a great deal of construction at Iraqi military sites to chemical and biological weapons, but neither the UN nor IAEA inspectors believed that such linkage was credible. The classified estimate contends that “Saddam probably does not yet have nuclear weapons or sufficient material to make them,” but the White Paper drops the word “probably.”13 Both the classified and unclassified versions develop scenarios for Iraq acquiring nuclear weapons within twelve months, although UN and IAEA inspectors found no facilities that were even capable of building a nuclear weapon or enriching uranium to weapons grade. The White Paper also obfuscates the importance of dissent in the classified estimate and downplays the expertise of the dissenters. For example, the CIA links Iraq’s attempts to obtain aluminum tubes to a centrifuge enrichment program and notes that there are “some intelligence specialists” who link the tubes to conventional weapons. It should have been noted that the “some” in this case referred to the opposition of the Department of Energy, which houses the most serious expertise on centrifuge technology. The several analysts at the CIA with their modest engineering credentials were certainly no match for the Ph.D. scientists at the Department of Energy. The White House and CIA handling of the aluminum tubes issue points to a campaign orchestrated by both institutions to make the case for going to war. The fact that Saddam Hussein made no attempt to hide purchases of these tubes also argues against their use in a nuclear weapons program. The post-war inspections of the Iraqi Survey Group, which was operated by the CIA, found no evidence of any chemical or biological weapons programs and no stockpiles of the weapons themselves. One of the most ludicrous aspects of the estimate concerned a so-called capability for Iraq’s unmanned aerial vehicles (UAVs) to threaten the United States itself with chemical and biological warfare agents “if brought close to, or into, the U.S. homeland.” It is difficult to imagine a scenario that has Iraq covertly bringing UAVs into the United States; the U.S. Air Force took an unusual dissent, which the White Paper did not even bother to repeat. The unclassified version of the estimate had two purposes: to create the impression that the intelligence community was of one mind and united on the threat of WMD from Iraq, and to support the Bush administration’s strong view that Iraq WMD represented a threat to the U.S. homeland.14 This effort on the part of the CIA was immoral, illegal, and unconscionable, involving the deletion of all examples of uncertainty in the classified document and the addition of worst-case views in order to create the impression of a gathering threat. Kamal also told UN officials in 1995 that Iraq had two SCUD launchers and one of them was disassembled, but the CIA estimate and White Paper recorded dozens in the Iraqi inventory.16 Several months before the estimate and White Paper appeared, the CIA told Congress that it did not know how many missile launchers Iraq had or how many warheads there might be to put on top of the rockets. Similarly, the CIA repressed the clandestine reporting of Iraqi Foreign Minister Sabri who corroborated the evidence of Iraqi destruction of their WMD programs. A senior CIA analyst, Paul Pillar, has written an authoritative account of the Bush administration’s misuse of the intelligence it received in order to “justify decisions already made,” but he falsely argues that the agency did not compromise any of its own assessments or estimates in the process.18 It is true that intelligence had nothing to do with the decision to go to war, which was decided upon early in the first term of the Bush presidency, no later than in the immediate aftermath of the 9/11 attacks. The senior members of the Bush administration paid little attention to the intelligence assessments on Iraq and requested no specific intelligence on Iraq other than summaries of non-existent weapons of mass destruction and non-existent ties between Iraq and al Qaeda. Unlike the Johnson administration and the use of force in Vietnam, the Bush administration did not request CIA memoranda as a check on the intelligence provided by the Pentagon. Bush and the senior members of the administration cherry-picked the intelligence they wanted, whether it was bogus intelligence on Niger’s uranium stocks or unsubstantiated intelligence on Saddam Hussein’s links to Osama bin Laden. The infamous national intelligence estimate of October 2002 was not requested by the Bush administration, which was aware of the differences within the community on key aspects of the Iraqi problem, but by the Senate intelligence committee. Bush and Cheney had fixed opinions about Iraq, and sensitive intelligence information would not change their thinking. But there was little “truth” in CIA finished intelligence on Iraq. Iraq’s entire nuclear program, including facilities and infrastructure, had been destroyed. The weapons design facility and all production equipment had been destroyed, and the use of gamma detection equipment would monitor any resumption of an effort to enrich uranium or plutonium. There could not be as much certainty about the chemical and biological weapons programs because of the more difficult verification and monitoring environment. Nevertheless, in this area as well, the destruction of the Muthanna State establishment meant there was no capability to fabricate new agents. In a formal acknowledgement of the obvious, the CIA eventually issued a classified report (“Iraq: No Large-Scale Chemical Warfare Efforts Since Early 1990s”) revising its prewar assessment on Iraq and concluding that Baghdad abandoned its chemical weapons programs in 1991.21 High-level Iraqi sources had reported that chemical and biological weapons programs had ended, but these reports never appeared in CIA finished intelligence. The politicization of intelligence creates serious consequences for the interests of the United States. —Any distortion of evidence of Iraqi WMD makes it harder to gain international cooperation in the war against terrorism and the campaign to prevent the spread of WMD. These efforts require international support. Information from foreign intelligence services has been essential in the capture of all al Qaeda terrorists thus far; any success in stopping the strategic weapons programs of Iran and North Korea, both more advanced than those of pre-war Iraq, will require international help. —Any misuse of intelligence by the White House, such as the forged documents on Niger, or politicization of intelligence by the CIA, such as the national intelligence estimate of October 2002, weakens the key instrument in preventing further terrorist acts and thus undermines U.S. national security interests. The misuse of intelligence during the Vietnam War prolonged a brutal and costly war. The manipulation of intelligence during Iran-contra in the 1980s led to political embarrassment for the Reagan administration. The misuse of intelligence on the Soviet Union led to unprecedented peacetime increases in defense spending despite the decline and decay of the Soviet Union. Any administration’s use of intelligence for political ends is unacceptable, particularly to make a specious case to go to war. —Finally, one of the worst possible scenarios for U.S. security interests, and those of the international community, would be learning that WMD materials had been looted or smuggled from Iraqi weapons sites. As former White House spokesman Ari Fleischer noted during the Iraq war: “(WMD) is what this war was about and is about. And we have high confidence that it will be found.” We lost an opportunity to verify any remnants of WMD in Iraq in the spring of 2003 when the U.S. military occupation made no attempt to investigate possible WMD sites, not even Tuwaitha, where Iraqis previously stored supplies of enriched materials. The only way to ensure that such sites were not looted of old materials was to deploy inspectors who had examined these sites in the 1990s. If the intelligence community is ever again to be in a position to tell truth to power, then the ethics of intelligence collection and analysis must be revived and revamped. The pattern of corrupt tradecraft in the run-up to the invasion of Iraq points to a larger problem within the intelligence community that will not be fixed by bureaucratic reorganization or new layers of authority. The new director of national intelligence, John Negroponte, has never acknowledged the existence of genuine ethical problems. More than three years after the start of the war against Iraq, there has been no attempt by the Senate intelligence committee to learn how the administration used the intelligence that it received or to investigate the illegal activity of the Office of Special Plans in the Defense Department in producing bogus intelligence. Senate intelligence chairman Pat Roberts (R-KS) continues to drag his heels on this investigation, the so-called “Phase Two” investigation, and Senator Jay Rockefeller (D-WV), the panel’s ranking Democrat, has offered no protest. The exaggeration of intelligence by top administration officials, particularly with reference to Iraqi nuclear programs (“the smoking gun cannot be a mushroom cloud”) and Iraqi links with al Qaeda, was obvious. Unfortunately, there has been no attempt to build an official record of their distortions. And the corruption of intelligence in the run-up to the Iraq War has received no investigation from the CIA itself or the congressional oversight committees. 1 Barton Gellman and Walter Pincus, “Depiction of Threat Outgrew Supporting Evidence,” The Washington Post, August 10, 2003, p. 1. 2 Dafna Linzer, “Prosecutor in CIA Leak Case Corrects Part of Court Filing,” The Washington Post, April 12, 2006, p. 8. 3 James Risen, State of War: The Secret History of the CIA and the Bush Administration, New York: Free Press, 2006, p. 117. 4 Bob Drogin and John Goetz, “How the U.S. Fell Under the Spell of ‘Curveball’,” The Los Angeles Times, November 20, 2005, p. 1. 5 Joby Warrick, “Lacking Biolabs, Trailers Carried Case for War,” The Washington Post, April 12, 2006, p. 1. 6 The New York Times, May 22, 2003, p. 16. 7 Warrick, “Lacking Biolabs,” p. 22.
www.whitehouse.gov/news/releases/2002/09/20020925-1.html, The Washington Post, December 27, 2005, p. 17. 9 Eric Schmitt, “Rumsfeld Says U.S. Has ‘Bulletproof’ Evidence of Iraq’s Links to al Qaeda, The New York Times, September 28, 2002, p. 9; John B. Judis and Spencer Ackerman, “The First Casualty,” The New Republic, June 30, 2003, p. 24. 10 Meet the Press: Interview with Vice President Cheney, NBC television broadcast, December 9, 2001. 11 Douglas Jehl, “Report Warned Bush Team about Intelligence Suspicions,” The New York Times, November 6, 2005, p. 14. 12 Bob Woodward, Plan of Attack, New York: Simon & Schuster, 2004, p. 249. 13 “Iraq’s Continuing Program for Weapons of Mass Destruction,” National Intelligence Council, Washington, DC, October 2002. 14 Jessica T. Mathews and Jeff Miller, “A Tale of Two Intelligence Estimates,” Washington, DC: Carnegie Endowment for International Peace, 2004. 15 Thomas Powers, “The Biggest Secret,” The New York Review of Books, February 23, 2006, p. 11. See Risen, State of War: The Secret History of the CIA and the Bush Administration. 16 John Prados, Hoodwinked: the Documents That Reveal How Bush Sold Us a War, The New Press, 2004. 18 Paul Pillar, Foreign Affairs, March/April 2006, p. 77. 19 “Decoding Mr. Bush’s Denials,” editorial, The New York Times, November 15, 2005, p. 28. 20 “Issues for the U.S. Intelligence Community,” Richard Kerr, Thomas Wolfe, Rebecca Donegan, and Aris Pappas, Studies in Intelligence, Volume 49, Number 3, 2005, p. 53. 21 Greg Miller, “CIA Corrects Itself on Arms,” The Los Angeles Times, February 1, 2005, p. 1. 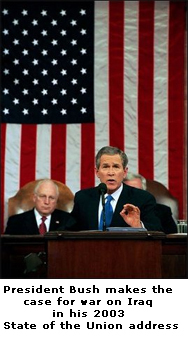 22 President George W. Bush, “World Can Rise to This Moment,” Speech, February 6, 2003. 23President Bush, Statement after Cabinet Meeting, June 17, 2004. 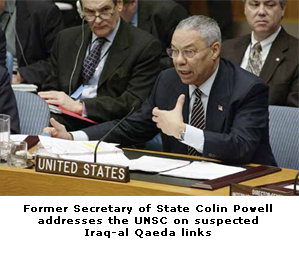 24 Secretary of State Colin Powell, Speech to the UN Security Council, February 5, 2003. 25 Secretary of Defense Donald Rumsfeld, Defense Department Briefings, February 4, 2003. 26 National Security Advisor Condoleezza Rice, Interviews on “Face the Nation” and “Fox News Sunday,” March 9, 2003 and September 7, 2003.